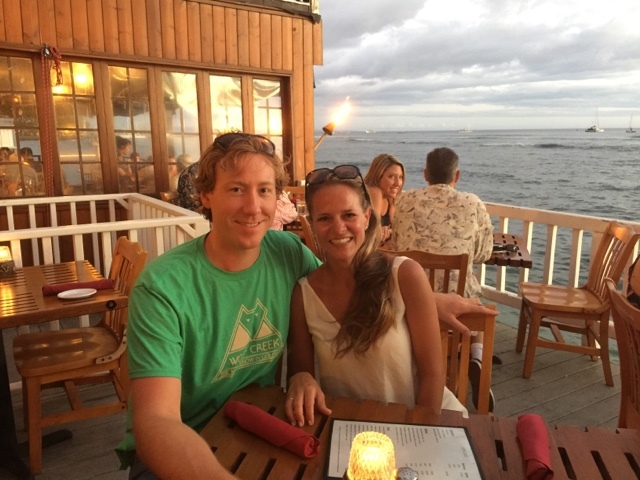 Please join us to see slides and hear about what we learned as we traveled almost 15,000 miles from Bellingham to Tahiti and all points between. Check out what the cannibals great grandchildren thought of their ancestors, what it was like to trade for black pearls, and where is the Great Garbage Patch, and how many days did it take to get through it, and much more. We hope you'll join us at the Co-op Community Connections Building at 450 E. Holly Street at 7:30 on Wednesday, December 2nd. 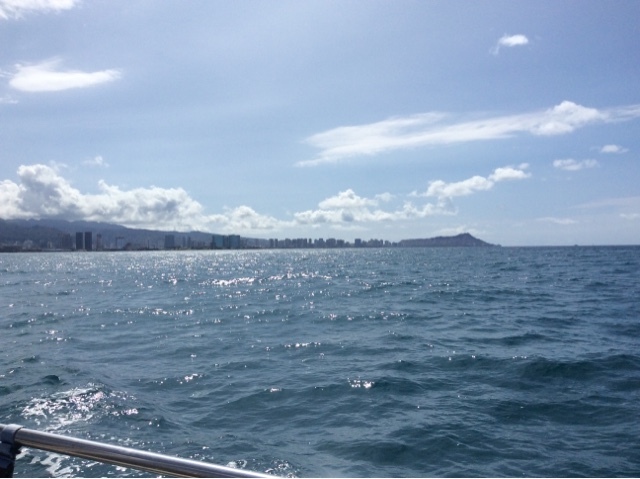 Ocean Clean Up Project, Almost Home! 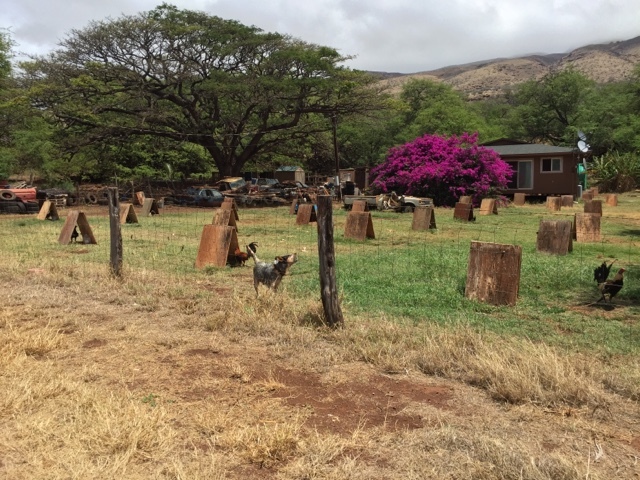 First, a correction on our last blog, it takes 25 days to go home from Hawaii, not 256. Sorry for the typo! We will arrive in Bellingham this afternoon and stay at the guest dock until we have a slip assignment. Our intentions are to live on board and enjoy town life for awhile while we look to see how we will get involved in the solutions. 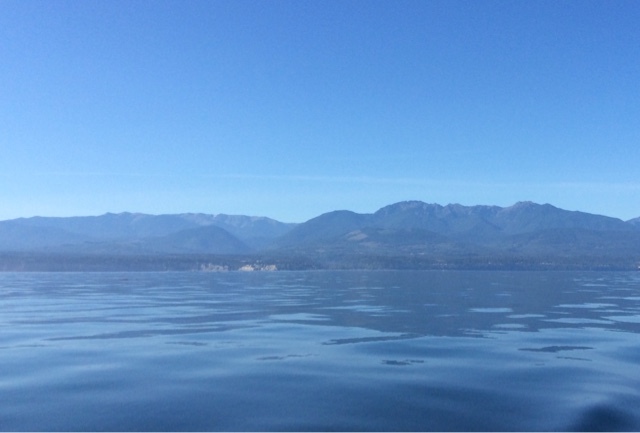 Passing out of Port Angeles this morning, we were reminded that we live in one of the most beautiful places on Earth. Hawai has nothing on us, (except, maybe the weather if you like it always 85). But we are also surrounded by sea traffic. Each triangle is a commercial ship. And we are a black boat shape near the bottom of the screen, just out of Port Angeles. In Port Angeles, we met John and Catherine and their daughters who also just arrived from Hawaii on their trawler. It's basically a motor yacht with a sail assist to improve mileage. They took one day less than we to make the passage, and used 1000 gallons of diesel whereas we used about 31 gallons for the three week journey. 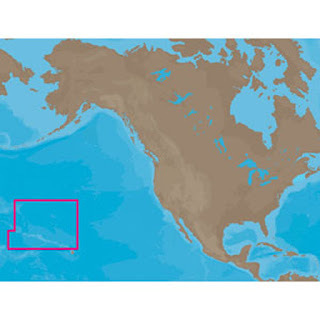 They joined many of the TransPac race boats in the OceanCleanUp Project and had been provided with a trawler net to skim and measure pastic density en route. They would trawl with the net for one hour at a time and generally collect about three cups of plastic, mostly granular, that floated on the surface. When you think of the very few decades that plastic has been in use, it is amazing there is so much. It is estimated that approximately 1/3 of the ocean's plastic is in the North Pacific Gyre, or the Great Garbage Patch. We are excited to be returning to our local Transition group, it's great to have such a supportive network. Check out Transition Whatcom to learn more. We are especially glad to be back in time to go to the Whatcom SkillShare Faire at the end of the month in Fairhaven this year. I want to learn more about keeping chickens and seed saving. Jerry plans to learn a thing or two from one of the the wood workers and more about mason bees. Very land based projects coming up, for which we are very grateful to be coming HOME! Aside from all the plastic, the International Space Station has been the only sign of other people for eleven days. That changed this evening, seeing four freighters and a jet contrail in the course of three hours. We have entered the shipping lanes and must be especially watchful. We got into a delightful radio discussion with an East Indian watch commander on the "Cetus Leader" from Japan that had just delivered a cargo of new cars to Long Beach and San Francisco and was headed home empty. I was struck with the imbalance of trade on that. He was fascinated how such a little boat could be out here in the middle of the ocean and we got to comparing our ships. They are 635 feet long to our 40'. Their life boat is longer than Heron Reach! Their beam is 105', ours is 12.5. They sit 25 feet deep into the water, our draft is 6.5. While it will take us about 25 days from Hawaii to Washington, they go from California to Japan in 12. Our deck is 3 feet off the water, sometimes actually under water when we are heeled over hard, whereas their deck is 115 feet off the water. Our crew of two is matched by theirs of 21. They never go outside as their boat is totally enclosed. We must have someone outside, on deck, 24/7. I was just fine with our end of the comparison, until he said they have a laundry room with machines. I have the galley sink. It took an hour of hard work this morning to make up for not having done any laundry in two days. I have a new appreciation for the strength of the old time washer woman. We spent about a half hour chatting with him and enjoying talking to another human being. Two more boats appeared the next night. We spoke briefly to one as our course was set to intersect. They politely changed course on our behalf. It seems strange that a huge, 1206 foot container ship would give way to a little sailboat, but there are "rules of the road" at sea, and a boat under sail has the right over one under power. They crossed about a mile in front of us, all lit up like a Christmas tree. Their draft was 40.4', a little deeper than we are long. The hard storm came on quickly and left us exhausted but too full of adrenalin to sleep. It built during the night, rained hard and blew 25 kts through the day. Winds kept shifting, making it hard to maintain a set course and a hard jibe caused us to lost the back stay support and tear the boom preventer. We pulled the main and flew a partially furled jib until the next day when it acted like nothing had happened. It was as though a child were having a major meltdown tantrum and you say, "Would you like some ice cream?" and they smile and cheerfully say "OK", like nothing has been going on. Fickle seas. As they calmed, I put on the climbing harness and Jerry hoisted me up the mast. Sorry there are no pics in radio transmissions, it was a sight! I reattached the back stay support. It was my first time having to go up the mast at sea - not fun - but I feel proud to have done it. Today we passed the 45th parallel, half way between the equator and the North Pole. Ocean temperature has dropped 20 degrees since we left the South Pacific! We are now back to both sails and the next weather is upon us. 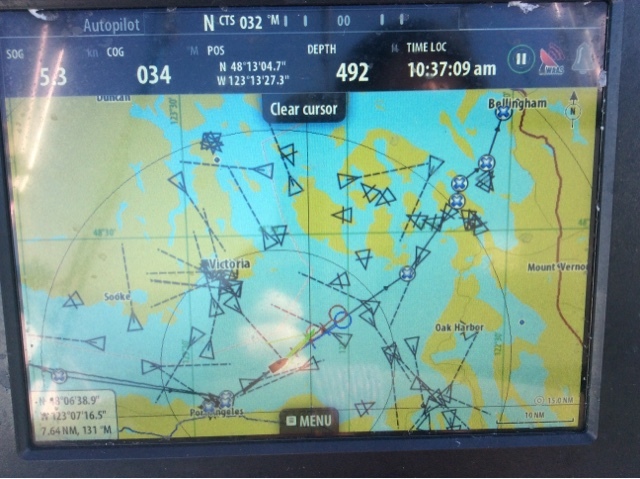 Winds are 19 kts and building and we are flying towards Neah Bay. We are soooo looking forward to sleeping through an entire night. These long sea passages are just what they say, days and days of lazy boredom, mixed in with moments of fear and very hard work. Typically, summer brings a large stable high pressure zone to the Eastern North Pacific Ocean. Currents and winds swirl clockwise, circling up past Japan, eastward across the Aleutians, down the North American coast, and back along the equator. At longitude 155 W, we are sailing the western edge of this high at a snail's pace of 3.2 kts. (3.7 mph). We could walk that fast! It isn't speedy, but as we go 24/7, we will make around 75 miles today. It will be several days before we are back in the wind, but we hope not to use the motor. This is the edge of the area known as The Great Garbage Patch. When we traveled the South Pacific, we saw some bit of trash such as a grocery bag or a plastic bottle, almost daily and plastics were splattered on atoll beaches. Here in the North Pacific, we see plastic almost at any time, even though we are only on the edge of the patch. We look out and see fishing buoys, bottles, bags, pieces of rope (we had to pull one out of the water generator blades), packing peanuts, and smaller unidentifiable pieces floating just under the surface. Very few people have actually traveled through the center of the patch, as there is almost never any wind there. Motoring through an area that large and polluted would be problematic. Catching a line in the prop could be a nightmare. Imagine having to dive under the boat mid-ocean to cut lines! With six five gallon fuel cans strapped to the side of the boat and a 35 gallon tank, we have a 65 gallon fuel capacity. Motoring would cost precious fuel and possibly cause prop trouble, so, we sail ever so slowly as we edge by this high. We are led by our parasailor spinnaker which billows gracefully before us. Research tells us that China is the greatest contributor to the patch. Americans produce far more trash per person than any nationality but we also have the best recycling and trash disposal system in the world. 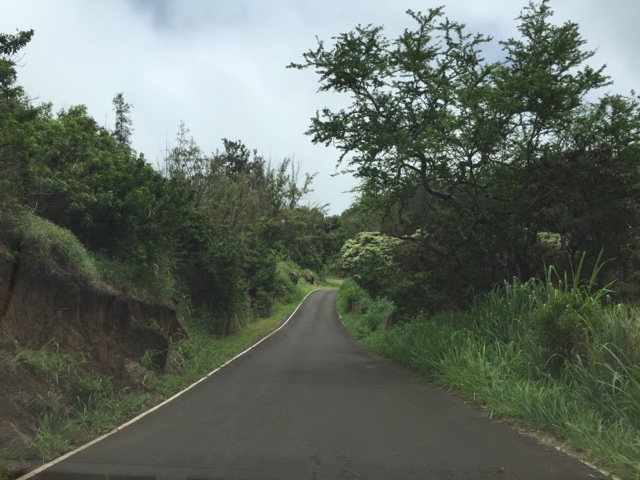 However, we saw scant evidence of recycling in the towns and cities of the west coast as we traveled down it and almost none in Hawaii. Most places had residential recycling, but opportunities for recycling for businesses and public areas was non-existent. It reminds me to be more diligent about reduce, reuse, and recycle. It is getting cooler as we travel north. Ocean temperature was 86 in the Tuamotus, but is 76 here and getting cooler by the day. We have started adding layers of clothing to night watch, but day is still hot. Aside from the plastic, the sea is also scattered with thousands of small man of wars, their bulbous bodies blown along by their tiny sails with stinging tendrils trailing below. A large school of fish are feeding on the surface. We can't tell if they are striking the man of wars, the packing peanuts, or something unseen. We drift quietly on at our snail's pace, saddened by the state of the sea. 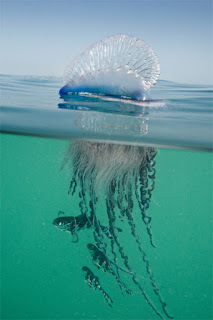 The Portuguese Man o’ War, also known as the Bluebottle, is a jellyfish-like marine invertebrate of the family Physaliidae. 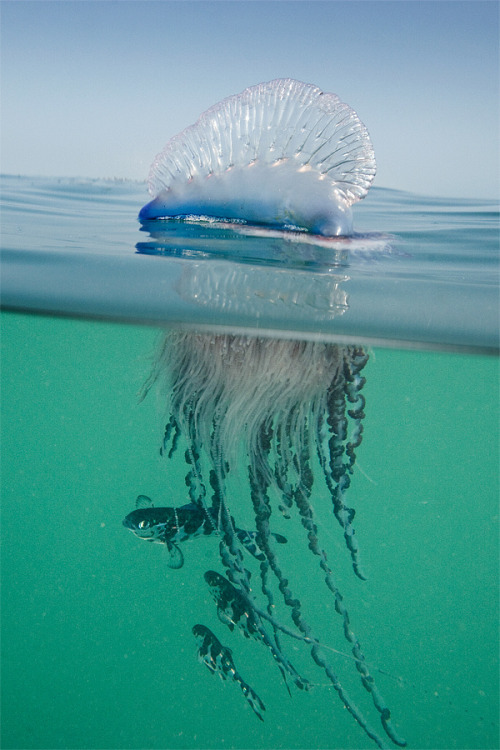 Despite its outward appearance, the Man o’ War is not a jellyfish, but a siphonophore. Siphonophorae differ from jellyfish in that they are not actually single creatures, but colonial organisms made up of many minute individuals called zooids. Each of these zooids is highly specialized, and, although structurally similar to other solitary animals, they are attached to one another and physiologically integrated to the extent that they are incapable of independent survival. It's 1:30 am and I just came on watch. I have trained myself to go to sleep at 7 pm so that I will be rested by the time I start watch at 1 am. There is a full moon and the seas are fairly calm. 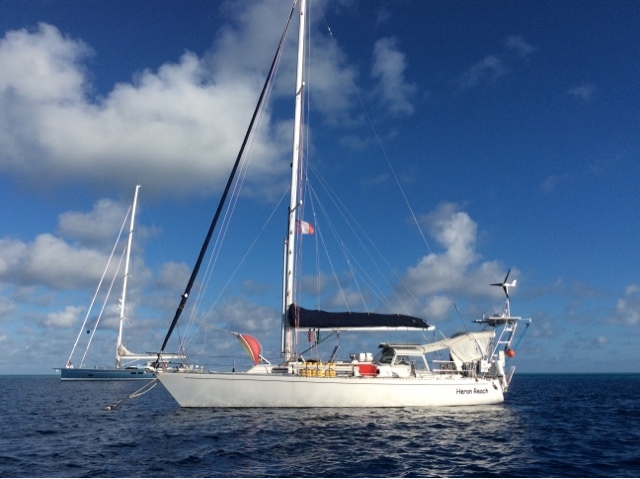 Gentle winds and low swells are coming against us but they are spaced far apart and there is no slapping or pounding as there was coming back to the Marquesas from the Tuamotus. When dawn arrives, we will have been at sea for five days on this passage, making a little over 150 miles a day, which is good speed for us, or an average of about 6.3 kts. (7.25 mph). Try driving down the street at that speed to get a feel for it, then imagine taking a coast to coast trip and sometimes speeding up to 7 and 1/4 mph on a 20 degree bouncing tilt, and you have sailing the North Pacific. Winds are predicted to drop in a day or two and we will travel about 600 miles through a high pressure area where we will be lucky to make 4 kts. 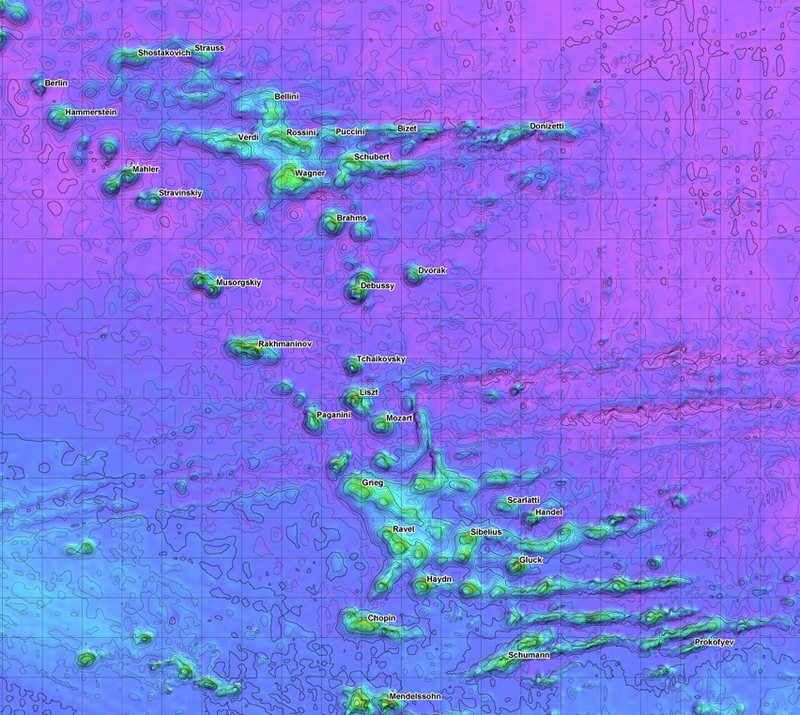 We have been passing through an area that the charts call the Musicians Seamounts which are under water spires of about 9000 feet named after musicians. Below us, we have the classics and romantics, as well as some modern ones. There are mounts named after Prokofiev, Rachmaninov, Schubert, Shostakovich, Ravel, Debussy, and Strauss well as Berlin and Hammerstein, about 35 mounts in all, continuing the SE to NW directional pattern of all the Pacific island chains. Of course, all of this is about 7500 feet below us. I can imagine some ocean cartographer naming them after his favorites. I would have added Gershwin. The full moon is darting amid wisping clouds and the night is quiet. I will play music in my head to accompany the night's beauty. And glad to leave the city behind, where the high rises seemed to dwarf Diamond Head Crater. 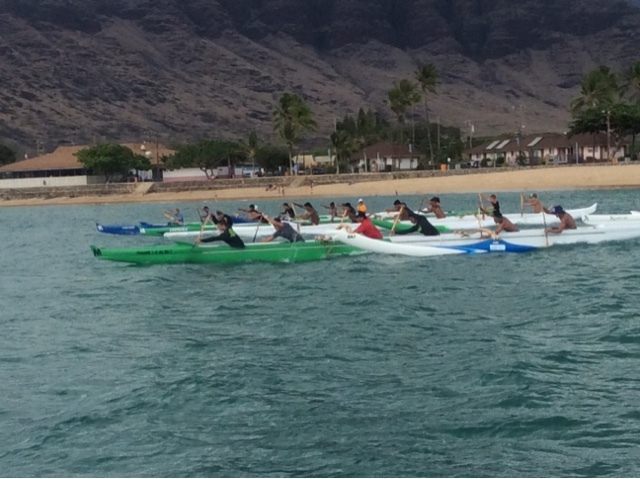 A short sail to the west side of Oahu brought us to Pokai Bay where the locals raced outriggers. We have seen outrigger races and practices in EVERY port we have visited except tiny, little Toau with its population of ten. We have seen soccer fields, but never with anyone there. More often, a horse might be grazing in it and always chickens scattered in the field. Speaking of chickens, they hide under the trees from the heat, excepting this farmer's yard where they each have their own shade spot. 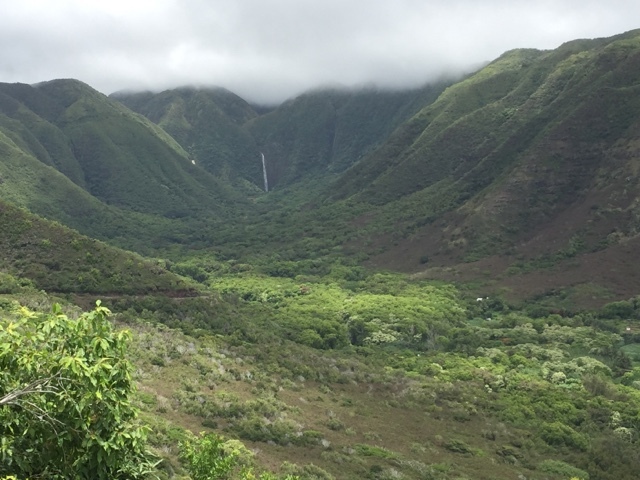 This side of Kauai has been the filming location for Jurassic Park, Avatar, Raiders of the Lost Ark, Pirates of the Caribbean, and many other films. It has breath-taking beauty. We leave in the morning for Washington, a trip of 2600 miles of open ocean. For much of our journey, the closest people to us will be the astronauts in the Intenational Space Station. That sounds like hyperbole, but they are only about 400 kilometers above us, reminding us of how very thin and fragile our atmosphere actually is. We will travel almost due north until we are level with Vancouver Island and then turn east as prevailing winds will turn from the east to the northwest. That will keep us out of the North Pacific high where there is no wind, but not out of the world's largest garbage patch. As we traveled through Polynesia, we saw some bit of floating plastic more days than not. Globally, the South Pacific has the least plastic and other garbage, while the North Pacific has the most, and has since long before the tsunami in Japan. Curbing plastic at its source is critical, for example, San Jose, CA found 60% less pastic in its creeks and rivers ( which empty to the Pacific) after instituting a plastic bag ban. There are so many ways to stop the pollution at its source. Tonight we'll enjoy a nice dinner in town, then our last night sleeping through the night until we arrive home. Our first two dives near Lahina on Maui were sobering. The ocean had very little life to it. We learned later that many of the easily accessible dive spots have been killed by all the sun screen in the water. Later in the week, we traveled to an under water spire off of the island of Lanai which showed only slight coral bleaching. 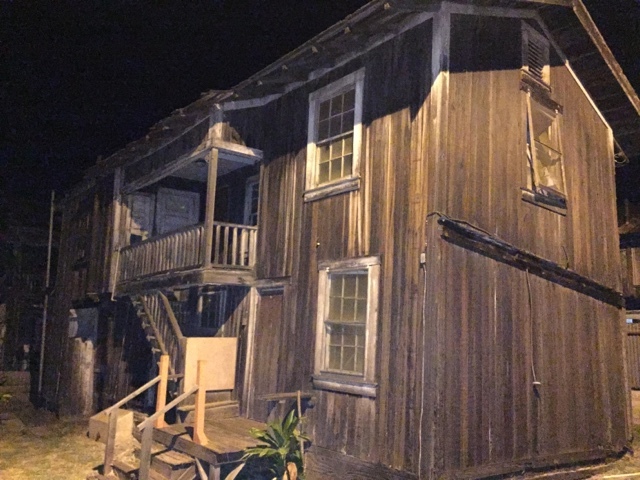 Sea turtles, parrot fish, and much more abounded. We were joined by our daughter Margot and her sweetheart, Desmond. 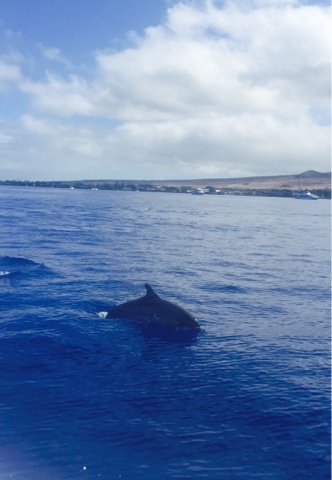 We took off for the island of Molokai escorted by a pod of Spinner Dolphins. Desmond was treated to his first sail ever, which included a full drenching as he sat in the cockpit, winds blew at 27 kts. and waves slammed over the rail. 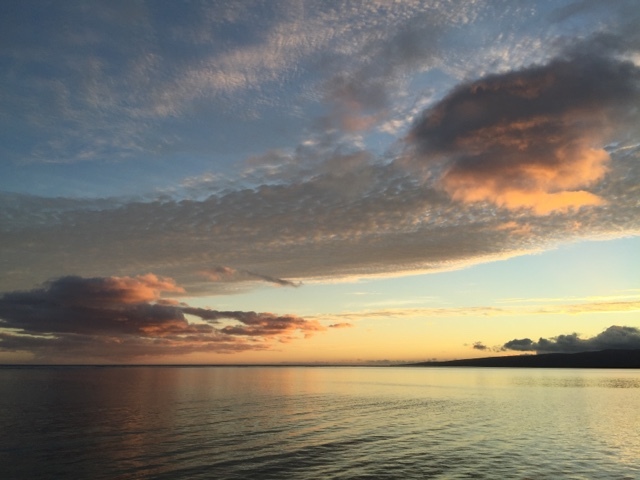 It was a fast trip and we slid into the quiet, small town harbor of Kaunakakai at sunset. Young men were swimming to a buoy and back. 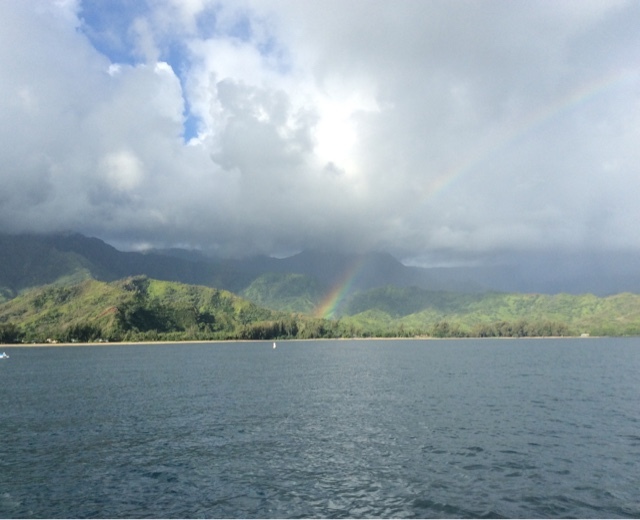 We waved a warm "aloha" and one of the young men shouted to us, "Go back! Go back home where you came from!" Our hearts fell. We were so saddened by that reception, we talked about pulling anchor in the morning and leaving without going ashore. 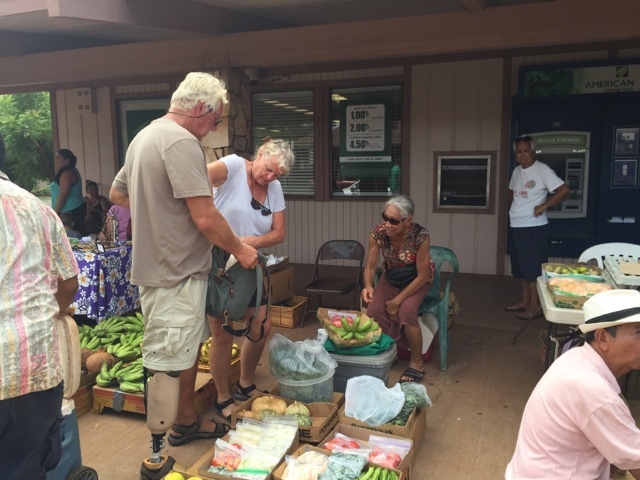 A man we had met in Lahina had told us he never traveled to Molokai anymore as he didn't like going where he wasn't welcome. 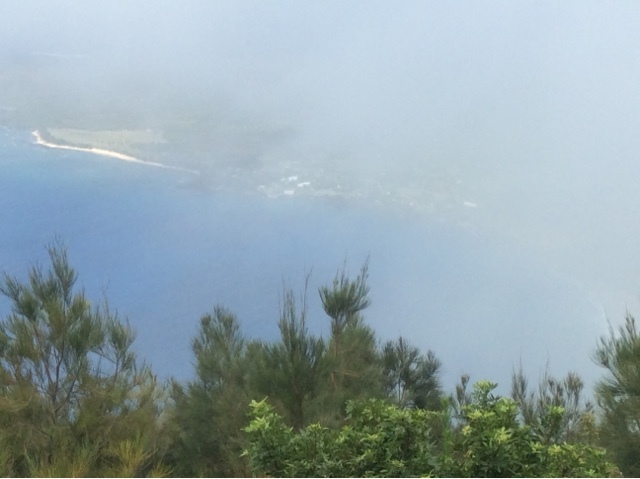 Interestingly, the nick name for Molokai is "The Friendly Island". 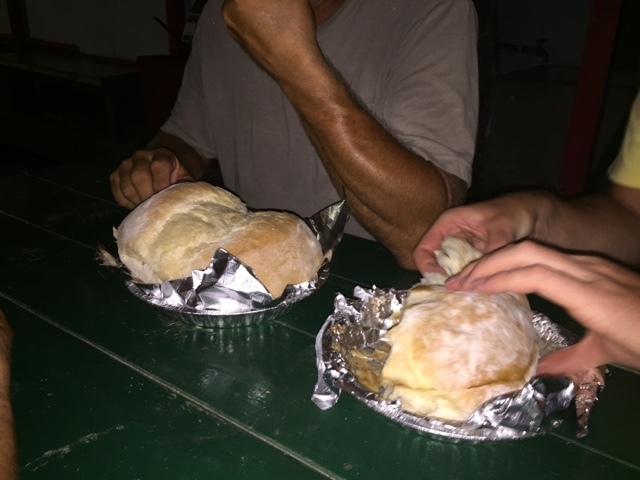 Instead, we decided to at least check out the famous pillow bread from the local bakery. At night, they close the bakery and sell the pillow bread out of the back alley. 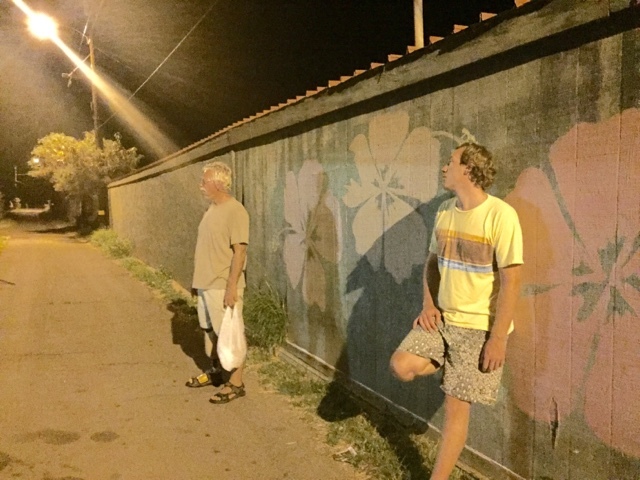 Walking down the long narrow, dark alley, we were confused and wary, unsure if this could really be the place. Far down the alley, a passage way branched off and we could see a light at the end. 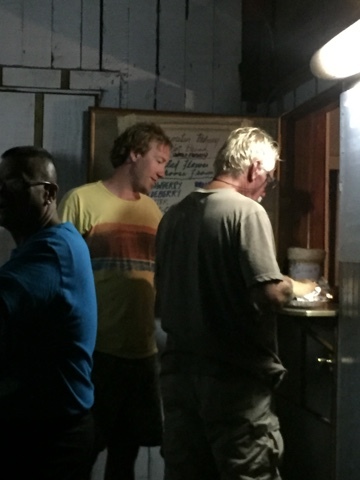 People were gathered, chatting with each other, waiting for their orders. Still thinking of our encounter in the harbor, we were surprised to find folks cheerful and curious about our journey. It was welcoming. We got cinnamon, butter and sugar on a soft round, 12" loaf and like our new acquaintances, tore into it with our hands.Yumm! 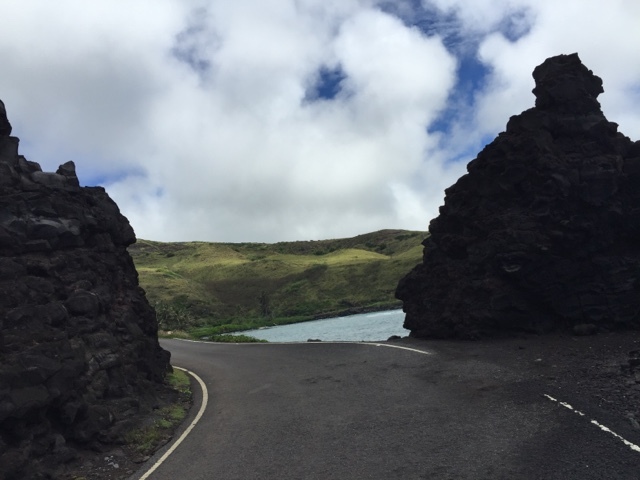 A car rental from Dusty's Repair, the local (rather than Alamo) fellow allowed us to wander the island. 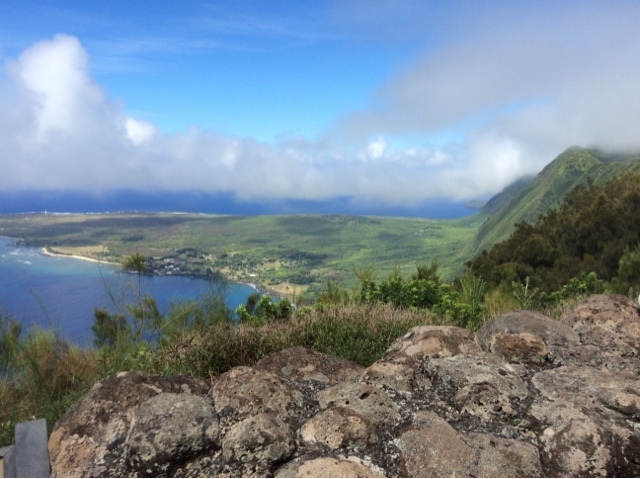 At 10 by 35 miles, Molokai can be traveled slowly in a day. 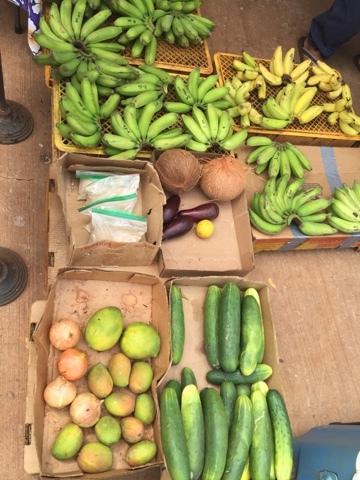 The farmers market added fresh tomatoes, onions, bananas, oranges and cucumbers to our provisioning. To the east, we saw a pristine valley. To the north, we stood at the overlook to see the old leper colony below, and we're disappointed at first, as it was cloaked in the mist. 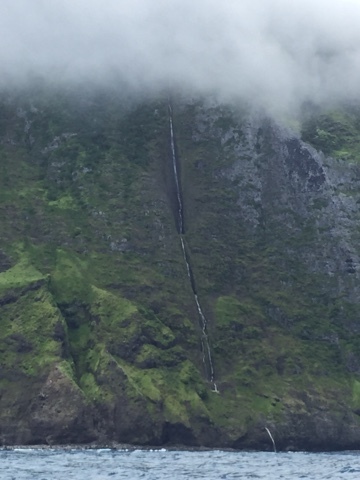 But moments later, it cleared showing the community below the cliffs, said to be the tallest sea cliffs in the world. Finally, the west side of the island has the longest white sand beach in the state and it was nearly deserted. We were so glad we hadn't let one unhappy man spoil our visit. We were met by warm and kind people everywhere. 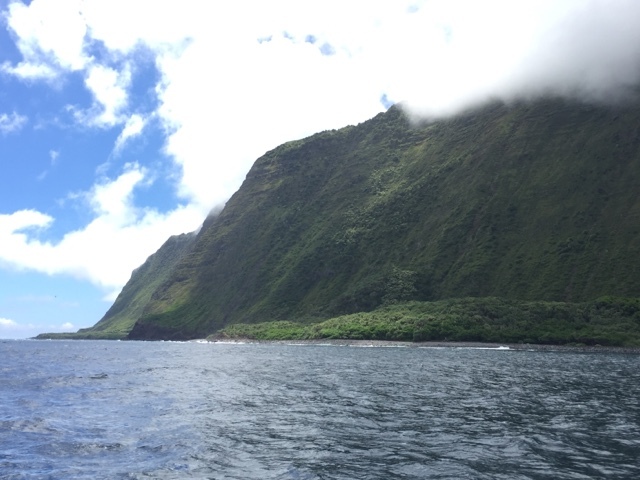 We hoisted our anchor the next morning and motored past the rugged terrain of the sea cliffs. 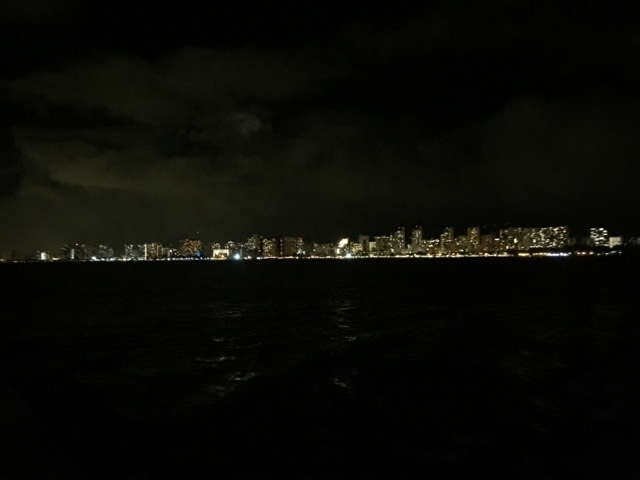 We arrived in Honolulu at night, wowed by the immensity of the city! 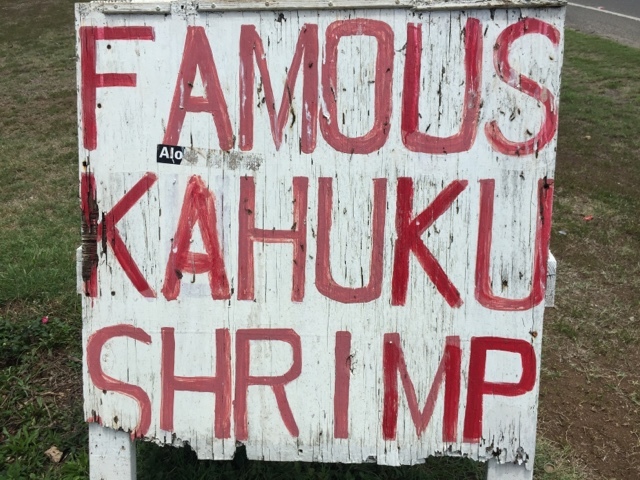 Honolulu, even more than Lahina, is brimming with tourists parting with their money. Cranes sprout on nearly every spot as new hotels, condos and retail space soar into the air. The architecture is creative, but who knows about sustainability. Hawaii has met or broken its own heat record 20 times in the past month. The island has an excellent recycling system and a state bottle deposit law that provides a steady 5 cent/bottle or can income for the homeless who abound here. On the other hand, Waikiki sports stores for Gucci, Rolex, Christian Dior, and more. It's a plethora of who's who of expensive fashion. The wide open doors lure people in with the air conditioning that pours onto the sidewalks. 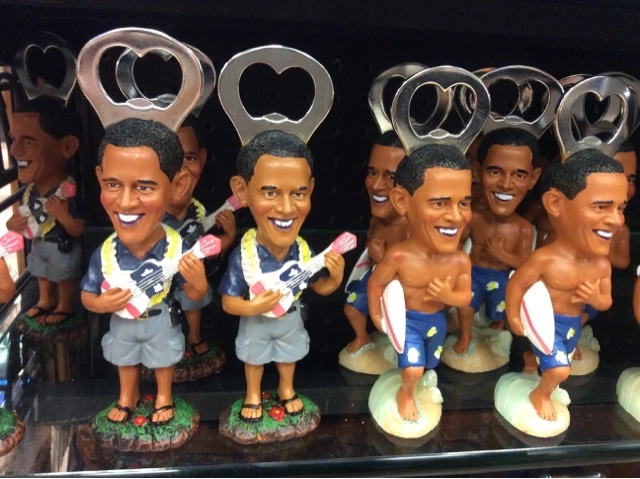 On the lighter side, the local ABC Stores, a kind of liquor/convience/tourist trinket chain offers Obama options. 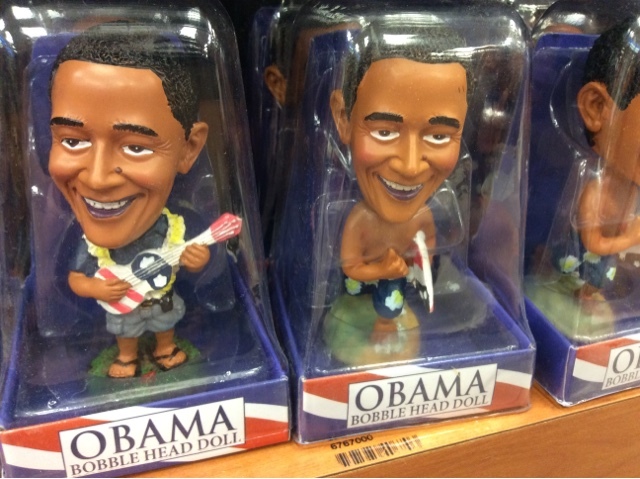 You can get an Obama bobble head for your car, or a can opener in surf board or ukulele style. We got the "kids" off safely after a delightful nine days with them. They chipped in at every turn and learned new skills along the way. It was a joy to be with family! We completed a few minor repairs (remember: the reason people sail is to be able to fix their boats in exotic places!). The sailmaker put a third reef in the mainsail to manage storms more easily. This form of removable nip and tuck allows much more flexibility, especially with the large mainsail of a J Boat. Here's hoping we don't need it. 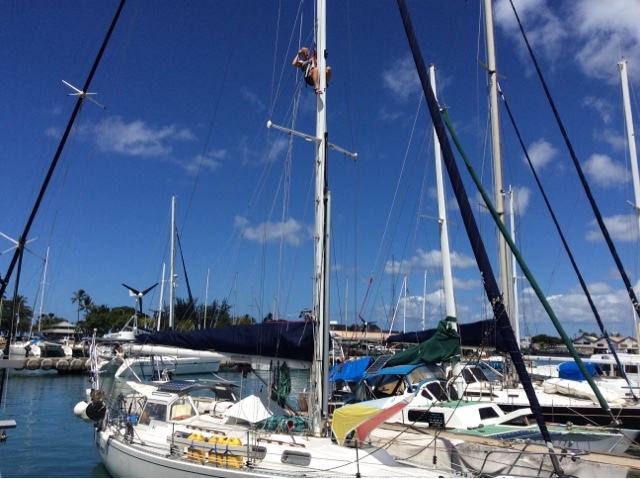 Here I am replacing the back stay onto the mast. and gave us suggestions for our next leg to Kauai. We sail in the morning, making way for the Trans-Pac race boats starting to arrive from the mainland. 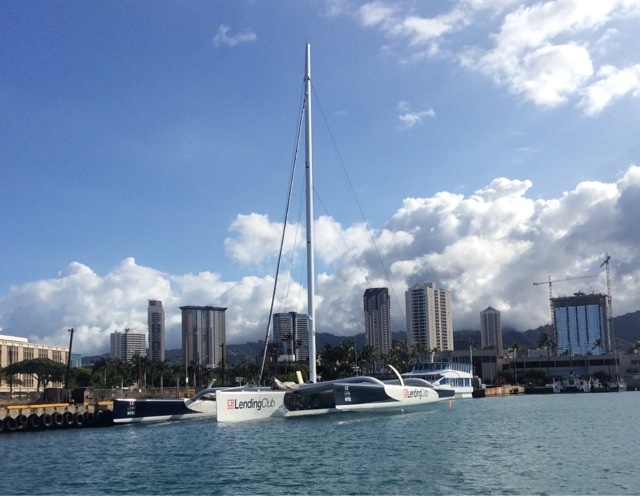 The 105' trimaran, Lending Club 2 arrived two nights ago, having dropped out of the race before it began to take advantage of a weather window. They set the new course record of 3 days, 18 hours from Los Angeles to Honolulu. We hit 12 kts twice in 10,000 miles, they averaged 24.6 kts. for over three days. We do 150 nm on a good day, the averaged just under 600 a day! And we are considered a fast boat! Wish us fair winds and following seas. Subscribe to follow our blog!